Yesterday the first Limited Edition 199 motor yacht discreetly left her shed at the Amels yard in Vlissingen. The yacht is highly customised to the wishes of the owner. It includes an enclosed sundeck area, a touch-and-go helipad on the foredeck and an additional folding bulwark. Launched in time to be ready for the coming season, the yacht is already offered for charter by Imperial Yachts. 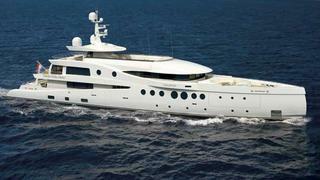 She will be available in Norway in May and June before heading to the West Mediterranean.